BYOD, Bring Your Own Digital Devices: The Next Wave in 1:1 Laptop learning in our schools? Our school, St. Gregory, is in its second year as a 1:1 laptop school, and it has been a very important and valuable advance for our students’ ability to research, to stay connected, to organize their calendars and school works, to communicate with teachers and peers, to publish some of their student work, to blog, to use digital video both as consumers and creators of knowledge, and much more. We took what I believe, two years ago, was a somewhat unusual approach to becoming a 1:1 school, but one which I think will become increasingly common, so much so that perhaps in a few years it will be the new normal. We knew that many of our students already had laptops they were using, at home and sometimes at school, and we decided to to build upon that foundation, structuring our program which invites students to bring their own device (BYOD), and supplementing it with a school-provided netbook to those who chose not to (or were unable to) provide their own. I think this was the right bridge, but we may move to a format soon where all students are expected to provide their own, and we give a stipend of some sort to support those who need it. We did this hybrid BYOD approach partly for the financial savings, partly because it seemed redundant to ask so many students who have their own already to buy a school device, but also because we saw a new format emerging, using the resources of the could in a OS neutral way to tap in the rich resources of the web and empower our students as creative and critical, digitally fluent, web users. This was not about using educational software pre-installed on the school-provided laptops; it was about supporting and expecting them to be networked Web 2.0 users. I should make clear that the strongest influence on my thinking about this BYOD approach as we developed it 18 months ago was the work and writing of Peter Gow at Beaver Country Day. (See related post, with a long quote from Peter, here). It is great to see that more and more educators are discussing and recognizing the value of this BYOD approach, and the way it is emerging as not just a low-cost alternative to the more conventional uniform school laptop employment but as having strengths in its own right, particularly in the way it reflects a different way of thinking of students as independent learners who use tools in their own way, under our close supervision, to access and analyze information and to communicate, create, and publish their own thoughtful and well-crafted product. If the previous is our goal for our students, BYOD as an organizing philosophy has strong advantages, and may be far more consistent with the Web 2.0, networked world of learning we are seeking to help out students enter, benefit from, and contribute to. A great conversation about this emerged recently on a list-serve I am on, ISED, and so many great points were made in advocating the value of this BYOD approach that I took the liberty of collecting some of them and sharing them below. These messages expanded my thinking and understanding enormously, and I feel very excited to see that what we are doing at St. Gregory may well be part of a much larger wave in an important educational evolution: there is increasingly I think a movement afoot, and it deserves wider recognition, for the value of BYOD 1:1. Many laptop schools see two layers of benefit to students. You have noted one: the potential for teachers to organize new kinds of classroom activities because each student has a laptop computer. That is important and desirable and perhaps the most immediately apparent change when 1:1 is introduced. However, students may experience even greater benefit to their own organization and productivity independently of any teacher-organized, classroom computer-based activities. Of course, there exist plenty of interactions between these layers, teachers can coach students in techniques for self-organization, and so on. Since adults usually initiate the discussion about whether to start a laptop program, discussions of costs and benefits tend to focus on classroom activities rather than on the entirety of a student’s work life. Just as adult professionals could hardly imagine doing their job without a dedicated computer, students (especially in the high school years) can complete their work more easily and powerfully in a 1:1 environment. Do you provide a laptop computer to each of your teachers? Would they work as well on a shared laptop cart computer at school and a dedicated or shared computer at home? 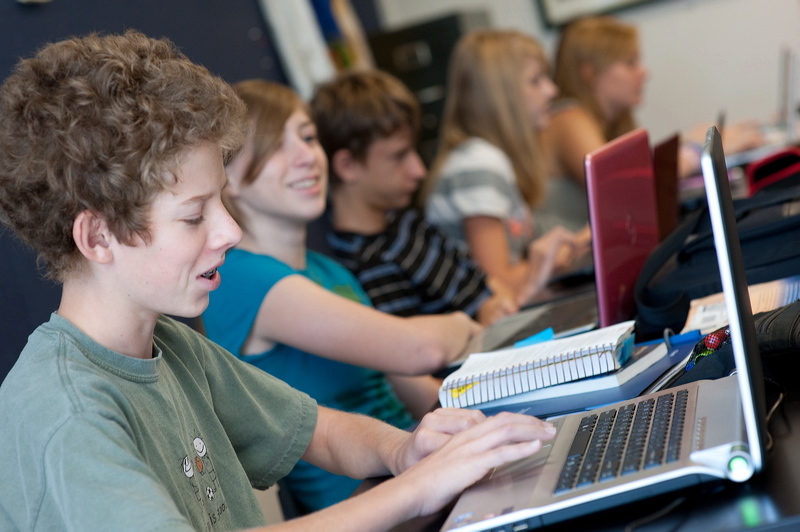 BYOD places more emphasis on student-centered computer uses than teacher-led, classroom activities, because of the lack of standardization of student computing devices. I don’t know if I could prove or measure this but in my (limited) observation BYOD students, especially those in higher grade levels, are often more versatile, resourceful, and creative in finding, using, and applying the best software tools for the task at hand. I would recommend that BYOD skeptics just visit some schools where such a program is working well. You’ll see netbooks and Airs coexisting along with the kids who own them (and frankly we see NO correlation between family affluence and the type of machine the kid is toting around). You’ll see kids using technology wisely and well, and a few kids using it not so wisely (but possibly equally well)–just as in your school, whatever your school may be. If the people in a school whose job it is to see that things are working feel as though they are working well (that is, if tech support is supporting teaching and learning and not fixing laptops or handing out loaners all the time), then I conclude that things are working. Every school has different needs, standards, and expectations, but I have yet to hear of a BYOD shop wringing its hands and wishing for the Good Old Days when they had to maintain a great fleet of mixed-age computers whose users had as much incentive to take care of them as they did to take care of their soccer jerseys. Believe it or not, I have found less disruptions because it forces teachers to focus on teaching not the tech. When all were school owned, the teachers tended to have them all working on computers at the same time, doing the same task. So when a student had a problem, it stopped everything. With different devices, students are all at different places. For example, some are hand writing notes on an ipad, some are typing notes in Word, some are organizing ideas in Inspiraion. When students work on projects they are using software they know well, creating projects with their learning style. Students are much better troubleshooters on their own device. What I have found, is teachers can have difficulty with this model since they are no longer the one with all the knowledge. They can’t do the monkey see monkey do model of teaching. It takes teacher training on how to work in this multi platform model. In terms of overall institutions, I suggest that we now need to convert from IT centric institutions to user-centric institutions. I wish I had a pithy slogan for that. Might make a great TED talk. This will be as hard for experienced IT people to do as it is for experienced teachers. I might go so far as to suggest that our IT folks have been both liberated from all kinds of “managing” and empowered to be creative themselves as theyhelp teachers and kids think creatively about how the power of technologycan be most effectively applied. (Egad, I almost said “leveraged”–slap my wrist!) They’re probably working harder, but they sure seem to be having alot more fun. Having run a large 1-1 program for over 10 years I view a move to a BYOD model as more of a liberation than a train wreck. Many of us who were in on the first wave of 1-1 were inspired by Seymour Papert and his vision that computers could empower and enable students. Achieving that vision was extremely challenging, what with keeping the inventory of laptops up-to-date and functioning, calming parents and administrators hyper sensitive to Internet safety issues, and working to alleviate the digital divide. Moving to a model where the computer support folks can get back to focusing more on the creative use of computers to improve learning is a wonderful thing. I believe there is a sea-change at hand in how we look at 1-1 programs. one key component to maximizing a student’s potential for success here and in college is dedicated access to a laptop or other digital device. And, just as “students (especially in the high school years) can complete their work more easily and powerfully” with a dedicated digital device, so too teachers are liberated to take greater advantage of digital resources such as the web, e-textbooks, and VLE’s. I believe very shortly, as it did in college in the last half decade, the discussion of laptop programs will sink into the digital sunset and the digital device will simply become a ubiquitous part of the landscape. Matt Montagne, Sacred Heart Cathedral Prep. them for a few years so they had all of their music, videos, important files and software. The kids viewed them as vital tools for socializing, communicating, tinkering and engaging in scholarly work of all forms. The tech support model was brutally simple-we would spend 15 minutes on the computer. If we couldn’t get it, we would lone the student a computer and she would take it back to Best Buy, Apple, etc to have it fixed. We were semi-intentional as well about not choosing core applications that tied us to any one device or operating system. We have a few loaners and a lab, but there is very little pressure on either. We use Google Apps for most of the obvious things, pretty much, and cloud-based apps for virtually everything else. Our kids do a ton of collaborative work, so Google Docs is their best friend. Apart from adding a few more power drops, beefing up the wi-fi, and laying on some extra tech support the first year (who soon became a useful resource for all kinds of other tech-y things to support teachers when it became clear they weren’t going to be out straight helping kids), we really just focused on helping teachers develop their own applications for a variety of Web 2.0 tools (all did the “23 Things” course during the run-up year). It’s been kind of ridiculously trouble-free. Yup, computers break down (but fewer than expected) and kids forget stuff, but on the whole our teachers and tech folks have been able to focus on finding places where some thoughtfully applied technology makes for better learning. Let me conclude with congratulating the all the fine contributors to the ISED list serve on this topic, for the remarkably high level of intellectual discourse, and to say, let’s work toward advancing the BYOD wave for better digitally empowering our students to be vigorous, web 2.0, digital citizens, communicators, creators, and collaborators. I just want to thank you very much for this great post. I’ve been looking into the BYOD for some time and this is the first time that I’ve seen a clear collection of advice, ideas and suggestions in one place. This is going to be one of those key pages that I share with the administrators when I try to propose this idea at our school. Thanks! Thank you for this great post. I have had exactly this kind of conversation with many of my teachers over the past few years in my role as assistant principal of North Middlesex Regional High School in Townsend, Ma. Many of our teachers have initiated their own tech experiments, ie: Moodle, EdModo, Ning, Schoology, Wikispaces, TeacherWeb, University of Texas etc. It is this non-standard experimentation that, I feel, would prepapre us for the leap to student use of non-standardized equipment. Many of our students possess their own technology, and those who use it regularly are able to produce some great work products. We are currently working to improve our networking infrastructure and with hard work, patience and some luck we should join these other schools currently riding the web 2.0 wave! Thank you so much for sharing! Our school is looking at implementing a 1:1. We’re still in the very early stages and looking at different practices. We’re leaning towards a BYOD model and it’s good to see the good, the bad, and the ugly.